Want to be part of the team? 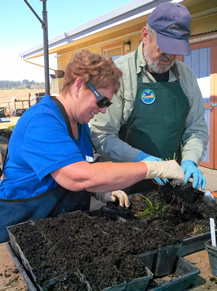 The Watsonville Wetlands Watch offers an enriching volunteer experience that serves to support people of all ages, physical ability and skill level. If you love the wetlands and want to help, we have an opportunity for you! working on special projects, like creating interpretive tools or doing research. Training: Because our docents go out on field trips with the children, we do require a 7 week training process. But don’t let that deter you! Many docents say this is one of their favorite parts of their volunteer experience. 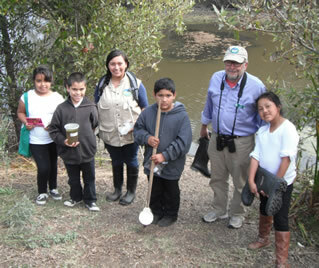 Docent trainees are treated to an inside look at the Pajaro Valley and its wide network of wetlands. Local experts share the ecology, history, and restoration of the wetlands during the 7-week training program, which includes Wednesday evening presentations and Saturday morning field trips. We have two main ways for volunteers to drop in as their schedule permits that don’t require going through training. Neither require any gardening experience. These are great ways to learn more about native plants in the Pajaro Valley. Wear old clothes, sunhat, and sunscreen. Garden gloves are provided. No training or garden experience is necessary. Maintain the Native Plant Demonstration Garden at the WERC which includes weeding, planting, pruning. Observe plants in their habitat and record findings as a group. Keep plant ID markers current and visible. Tools and Gloves provided. Bring kneeling pad if desired. Every 4th Saturday of the month community members gather to help restore wetland habitat. The work includes planting native plants, removing exotic invasive plants, and helping in our native plant greenhouse. They work from 9am until 12 noon – and always make time for bird watching or a short hike around the wetlands. We supply the gloves, tools, and a snack. Meet at the WERC. Any of these sound interesting to you? Are you ready to come help preserve the wetlands? Contact Noelle Fletcher at or at (831) 455-6771 to get started!